Female saxophone quartet for hire. Formed in 2007, All Female Saxophone Quartet has created a new wave of classical music under the creative drive of saxophonist and composer Sarah Louise Ings who studied at Guildhall School of Music and Drama. They are available for headlining work, corporate events and weddings in the UK and abroad, they are suitable for any event requiring the WOW factor. 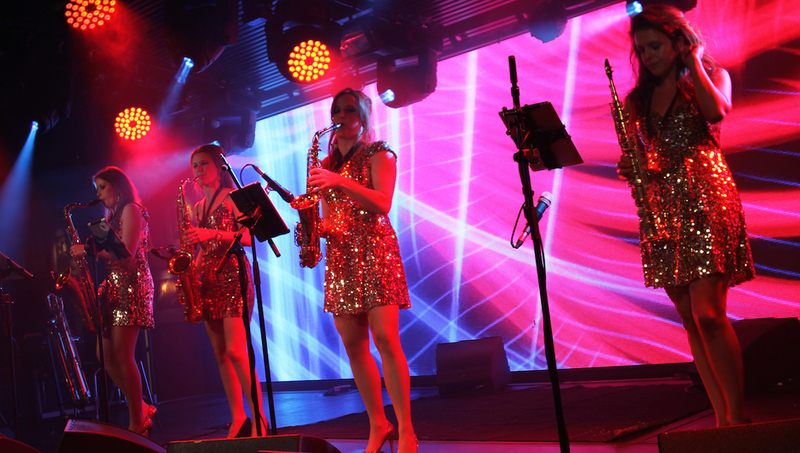 All Female Saxophone Quartet’s electric show is a fully choreographed high impact music show featuring the ever popular Palladio, Sahara Tango, Cantos Espania and a hi-energy salsa track. Hugely talented and great fun. These talented young musicians deserve encouragement and support. The girls were incredible and the feedback that we had from our clients on their music was brilliant. Quartet – saxophone, 2 violins, cello. To ensure you get the best show possible they come with their own sound technician who is included in their fees. As an optional extra they can perform a background set for you before their show to include jazz and classical pieces and music by Madonna, Britney Spears, Eurythmics and Cold Play. 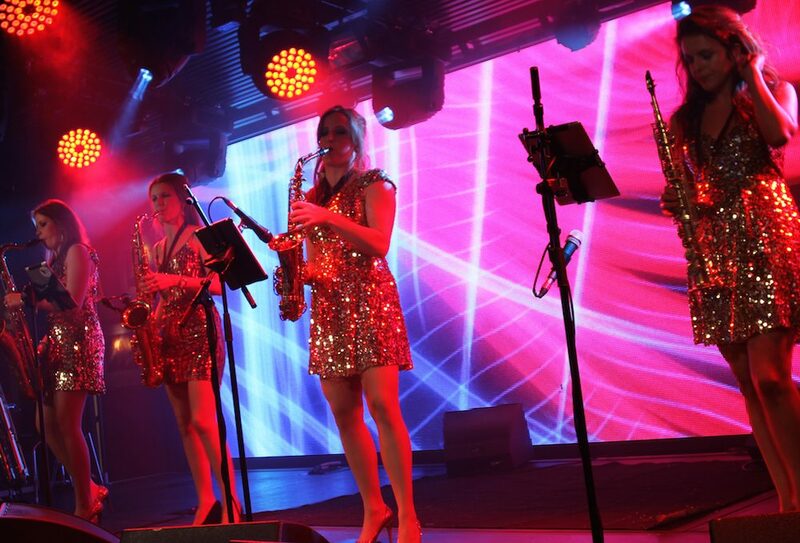 All Female Saxophone Quartet have performed to over 20, 000 people, been the face of Walk the Walk for Breast Cancer Bristol, been interviewed by Muso and Classical Music Magazine and featured in the MU newsletter which goes out to 70,000 readers. They have been lucky enough to perform together at the Liverpool Arena, at the opening of the Harrods sale and as support for Marcella Puppinni and American Singer Julia Nunn. Their careers have also bought them together with other musicians performing on the xfactor, at the O2 arena with Madness, the Royal Albert Hall with Tine Tempah, on a tour with Classic FM and Yamaha, at the opening of the Hackney Empire with HRH Prince Charles and on Radio 1’s Live Lounge. For additional impact this act is available with live band, brass section, DJ, beatboxer, percussionist, Rapper, dancers or electric guitarist. The Hoosiers, The Mystery Jets, Klaxons and The Stone Roses. In 2008, Clarkson was booked for main support alongside BBC Radio 1’s Zane Lowe in Cardiff and following this, she has since supported Ian Watkins of the Lost Prophets, Pendulum, Edith Bowman, Audio Bullys Jaguar Skills and Fabio. Forever growing as a commercial name, Kelz Clarkson has broken the festival circuit, playing 2,000 trees festival and Leeds festival 2010 to over 3,000 people. Kelz Clarkson is a name that is receiving regular recognition from industry professionals including the top ten DJ list of Dirty Smart Clothing 2010 (The Djs Clothing Label) and the remaining 4 DJs of the Corona Movida DJ championships 2011 (making her one of the top four DJs in the UK as rated by Corona Movida). With past residencies including The SYNDICATE SUPERCLUB in Bristol, HYPERSONIC, BROKEN and ACADEMIA Clarkson is looking forward to big things in her future. She has performed on tour dates with The Renegades (Feeder’s alter ego band), had her Correctional Therapies 60 minute mix featured on Kiss FM, Kelz and is now the official DJ for Sarah Louise and All Female Saxophone Quartet.